I’ve been cooking for as long as I can remember and in certain periods of my life I did not have much time to spend in the kitchen – I needed delicious yet quick meals for weeknights. On my days as a single lady I used to make lots of pasta – both my dad and my sister are crazy for it and dinner would be on the table in less than half an hour. Recently I’ve been trying my hand at Asian recipes and some of them are absolutely delicious – and equally fast. 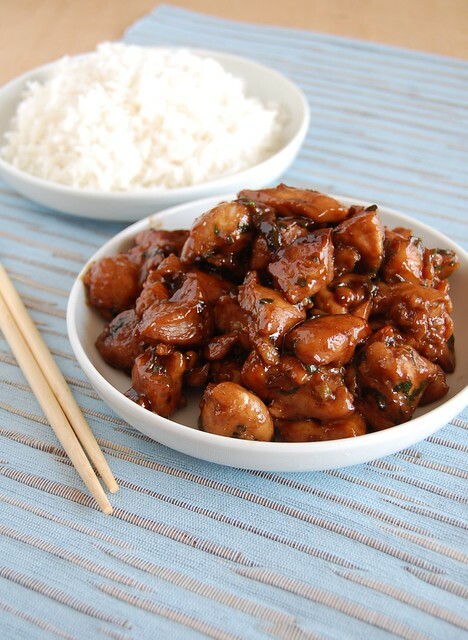 This chicken teriyaki is a great example: it has instantly become a favorite of my husband’s – a.k.a. "the picky eater" – and it took me moments to put it together. My husband is not a picky eater, but he loves all things Asian, and would adore this chicken. I made this too! It was very good! 1 3/4 oz chicken for 4-6 people? Was that a typo? Should that be pounds? That looks great with the fluffy rice on the side! Yummy! My partner (who is half-Jap) adores this dish! Yours looks wonderfully brown and delicious! I'm SO glad you posted this recipe! I've been wanting to learn how to make this but have always been too afraid to try. It sounds pretty easy so I guess all of my worrying has been in vain! Can I use chicken tenderloins? if you take out those ingredients it will no longer be teriyaki sauce. Yes, sake is a kind of booze. I cannot guarantee the alcohol cooks off entirely. The sake cooks off well enough, in my opinion, but I love wine, beer etc on the food, so... But I think it does (cook off). PS: mine didn't get that brown though... Wondering what happened. Maybe I should have cooked it even longer? I'm so glad to hear that! As for the browning, did you use chicken thighs? I love chicken teriyaki and this was delish! I didn't have sake or rice wine on hand so I subbed some rice vinegar and white cooking wine and it was still great. My sauce did not really thicken up to my liking so I added in a touch of corn starch. Thanks for the recipe! Konjo, I'm so glad the recipe worked out for you! Good to know it works with different ingredients, too. Thank YOU for letting me know how it went! My son is EXTREMELY picky - typically hates any food that has a sauce (no kidding!) but he loved this and asked for seconds. SO much better than any store bought Teriyaki sauce. Thank you for this recipe! I'm so glad to hear your picky son liked the dish! Thank YOU for letting me know how it turned out! Not sure what I did wrong but it was disgusting! Chicken was dry and sauce never thickened. Oh, Stacy, I'm sorry to hear that - did you use the same ingredients? I have made this many, many times now and it's one of our favorite dishes. My sauce also never thickens, but I just add some corn starch until I get the consistency that I want. I also use dried ginger since we rarely have any fresh on hand. I have made it with both chicken breast meat and chicken thighs and the thighs and while both are good, the thighs definitely give you a better texture. It is so good! Hey, Heather! I am so glad to know the recipe worked for you! Thank you for letting me know! I just wanted to say that I've used this recipe many times and it's always worked out really well. The flavor is wonderful and the I've never had any problems with the sauce thickening. Thank you for a great recipe. Ashley, how sweet of you to stop by to let me know that! Wonderful news! Making this dish now. Crossing my fingers that it turns out. It turned out great. Thanks for thr recipe. I will def make it again! Hey, there! That is excellent news - thank YOU for letting me know how it turned out. I just made this and it turned out great - tastes better than local Chinese available in this area. I do believe the ppl substituting other ingredients for the mirin & Sake are not getting the sauce to thicken. These would be key to the taste & thickening - worth the investment in my opinion. I'm so glad to hear the recipe worked for you! Thank you for letting me know and for your thoughts about the thickening issue the others faced. Uncover the chicken while cooking, this will help the sauce to reduce and thus thicken. Hi there, I have no idea. My sauce did not really thicken up or get the lovely brown color in the picture...I have to say it looked pretty ugly...not sure where I went wrong...but the taste was still very good! Thanks Patricia, I made this last night and it was a great success. I used the whole sauce quantity (including all your ingredients) for a smaller portion of chicken thighs but it reduced down to a lovely, very dark, sticky goo as I left it uncovered throughout and cooked it a little longer. I also let it marinade for at least 40 minutes as I took a phone call and got distracted! My husband said it was restaurant quality so I'll definitely make it again.